If you have read anything lately the world is a foot with news of “Microsegmentation”. Every vendor sells a solution that achieves this outcome. It is very easy to get caught up in the hype and awe of marketing and sales drones. But when rubber meets and road and you actually look at how to implement it where do you begin? The session is built around the concept of taking people through the design considerations that relate to micro segmentation and a handful of ways to build an automated security architecture. Learn from people who have done it before and how they approach Microsegmentation with VMware technologies. Session Sponsor Juniper Networks will discuss the Virtual Chassis Fabric solution and how through software abstraction the importance of a robust underlay network is paramount. 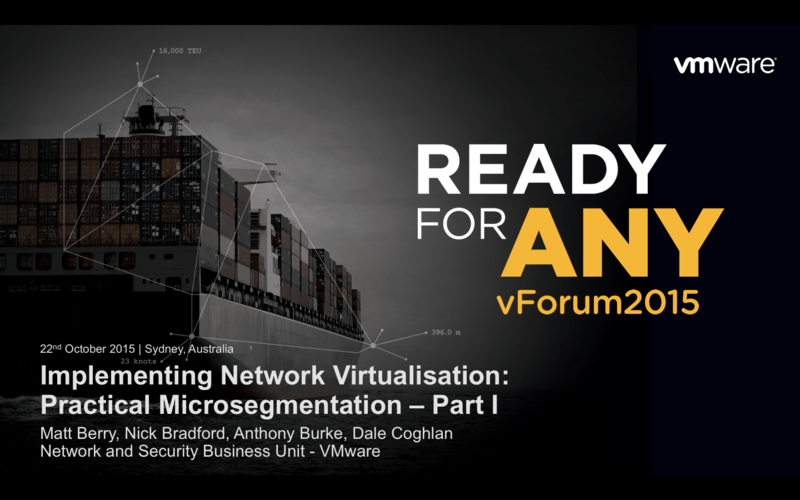 Closing off a customer panel of household name vendors who have implemented NSX in production will share their stories on pre and post implementation of Network Virtualisation. This insightful panel will encompass the good, the bad, and the ugly in ensure that no stone is left unturned in the minds of the attendees. This 3 hour session will run twice over the course of the All Access Pass Day 2 of vForum. There are other streams that cover Data Centre optimisation, Cloud, Innovation at VMware and End-User compute. Attendees are able to attend whatever session they desire. Each stream will give away an Apple Watch during the panel for best interaction / question asked by an audience member. Having one of these myself for about 3 weeks I can say it is pretty cool and I have barely unlocked many of the uses for it. Day 1 is a free day that has VMware and its partners talking about everything happening in the world of Virtualisation. It is free and there is also a concert at night put on by VMware featuring Sneaky Sound System and Eskimo Joe. If you’re interested – sign up here.